Update: Some good news to begin the new year here at PNG! 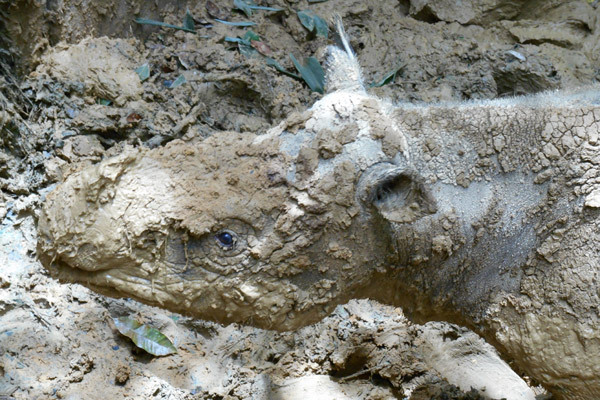 Iman, (see below) Malaysia's last surviving, captive female rhino has come out of her mud wallow and is recovering from a bleeding tumor in her uterus. An intensive course of medication and controlled diet has reversed her deterioration according to her keepers. Conservationists were worried that Iman would die, leaving no hope for a captive breeding program in Malaysia. Iman is believed to be fertile, so she represents the only source of rhino eggs in the country. The technology to freeze, preserve and thaw their eggs does not exist. An earlier urgent request for frozen sperm to inseminate females was ignored by the Indonesian government which has a much larger program underway. Iman is not out of the forest yet, as she has not resumed her normal eating habits and there is still some bleeding from her reproductive organ. She is given intravenous supplements and her favorite foods to encourage her full recovery. Iman and her male partner, Kertam, live at the Tabin Wild Life Reserve under the care of BORA, the Borneo Rhino Alliance. The study was published in Current Biology and used genes from Cincinnati Zoo's deceased male rhino, Ipuh. [photo above] The genome analysis showed that rhino population peaked at about 57,800 individuals, but by the end of the Pleistocene that number plummeted to just 700. Today, an estimated 30 survive in the wild in four distinct population groups. The official estimate is 100 but that is considered overly optimistic by experts. 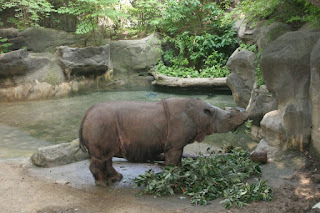 The Sumatran is the only surviving member of the genus, Dicerorhinus, so its loss to Nature would be a huge loss indeed. It is a genetic relic of a large family of rhino species that roamed the Eurasian continent 15 to 20 million years ago and included the woolly rhinoceros, which was hunted to extinction 10,000 years ago by Homo sapiens. Conservation efforts have been hampered by a lack of support from the Indonesian government. 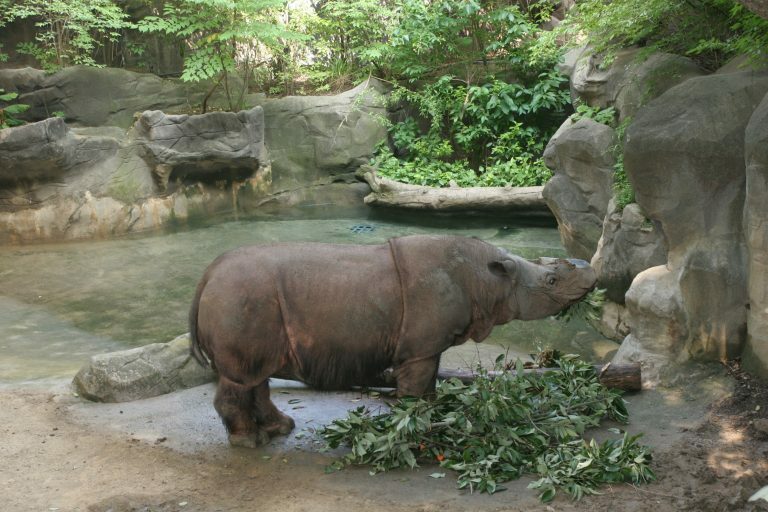 According to Mongabay.com, a fragile consensus was reached between experts that more rhinos must be captured from the wild and brought into places like the Sumatran Rhino Sanctuary (SRS), where a captive-breeding program is underway. The recommendations include taking all rhinos out of Indonesian Borneo and Bukit Barisan Selatan National Park, in southern Sumatra and Kalimantan. “Even more important,” according to a meeting document, is catching fertile rhinos from the Way Kambas population. All of these recommendations were passed to officials, but no official action has yet been taken.